This week's PopMatters post is about Uncharted 3's existential crisis. That sounds a bit pretentious, but I can't think of a better way to describe the position the game finds itself in. On one hand, the Uncharted 3 is an elegant roller coaster: beautiful set pieces, excellent writing, and substantive characters funnel the player along a meticulously designed track. On the other hand, Uncharted 3 is a surprisingly traditional video game: it is unforgiving of mistakes during crucial action scenes, it's combat attempts to create dynamic situation over lengthy battles, and progression is marked by contrived difficulty spikes. The game goes to impressive lengths to craft a brisk, unique plot, but its arcade-like difficulty and repetitive environments give the gameplay a retro feel. It's as if you're playing an updated version of a sidescrolling brawler, with all the frustrating deaths those games entail. Clearly, Naughty Dog loves the Indiana Jones series. 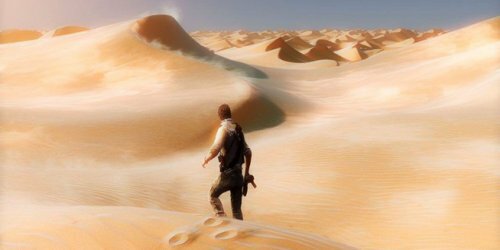 Uncharted 3 is basically a love letter to Raiders of the Lost Ark and The Last Crusade Flashback that shows the childhood origins of the protagonist? Check. Scenes where the protagonist runs towards the screen, away from giant environmental hazards? Check. Caverns full of creepy crawlies? Check. Fist fights with freakishly-large enemy bruisers? Check. Chasing a jeep caravan through the desert on horseback? Check. The list goes on, but you get the idea. Richard Lemarchand, co-lead designer of Uncharted 3, has stated that they wanted to make the video game version of a summer blockbuster. From a visual and tonal perspective, they are clearly on the right track. However, the gameplay violates key tenets of good action movies: the game is repetitive and it allows us to fail. Indy only runs away from one boulder, only encounters one cavern of snakes, and he only fights one huge brute. Things get dicey, but he never fails. In Uncharted 3, we play through the same basic action sequences (and climbing sequences, for that matter) multiple times, we repeatedly encounter supernatural spiders, and we fight gigantic dudes every couple of levels. Before too long, the mechanics lose their novelty. Waves of enemies, unexpected obstacles, and good old fashion cheap deaths detract from Nathan Drake's image as action hero who always makes it out of even the most helpless situations. Ultimately, Uncharted 3 commits the biggest mistake action movies can make: it gets dull. Uncharted's cinematography and storytelling is the best in the business. It's become so outstanding that it has become incompatible with some of the most important traits of the video game medium. Games are excel at providing settings that allow us to experiment, challenge ourselves, and learn from failures. Repetition and iterative learning environments are what make games special, but action movies don't work that way. We don't want to see Indiana Jones fail to jump out of a burning building in time or spend half and hour shooting two-dozen faceless guards; we want to see him succeed. The same goes for Drake: seeing him repeat the same challenges and slogging through multiple botched firefights doesn't play to the game's strengths. I think Uncharted 3 demonstrates that the series needs to move on and shed some of its more traditional game-like qualities. I have a number of ideas as to how this could be implemented (which I hope to share in the future), but for now I'll simply say that not all video game traditions are appropriate for modern titles. In many ways, the Uncharted series is experimental: it pushes technological boundaries, explores the line between cut scenes and interactivity, and makes a huge effort to develop its characters. I think it's time for the series to bring this innovative spirit to the gameplay: shed the notion that a game needs to have so many levels or that mechanical challenge necessitates fail-states. I hope the next installment charts a course away from traditional shooters and game mechanics. If any series is in the position to explore the possibilities of "interactive experiences," as opposed to "games, it is Uncharted. After playing LA Noire, I'm not so sure the absence of a fail-state would necessarily solve the dissonance either. In fact I think both of these games, in so far as they technologically succeeded in constructing a simulated cinematic experience, have both demonstrated what I think is a fundamental incompatibility between this design approach and how people actually play games and what they expect out of them. The more technological fidelity is allowing designers to realize cinematic tropes, the more uncomfortable and restrictive they're beginning to feel in the context of gaming. I'll be surprised if someone actually ever solves this problem before game design just moves on. U3 had such a weird reception. After some time it almost seemed like reviewers were trying to apologise for their high scores as they saw how players' reactions were not so hot. Well I'm definitely looking forward to playing this next year or so and see for myself. I missed it when it first came out, but that makes me very interested in playing L.A. Noire. It will be interesting to see what comes of the "cinematic" movement as the years go on. As you say, it might just fade away. Or maybe it will assume a role similar to the one adventure games find themselves in: a small sub-genre with a dedicated following. I agree that Uncharted 3's reception was strange. From my perspective, it's essentially the same game as Uncharted 2, which everyone (besides me) inexplicably liked. Maybe more people are tired of the repetition, or maybe now that the initial visual spectacle is not as novel, people are feeling hoodwinked. I don't know, but I find the whole thing fascinating. I think the cinematic aesthetic, if we can call it that, is here to stay. Film still offers some amazing experiences in a medium with which we all feel comfortable. As long as film is appealing, incorporating filmic elements into games will be too. @ Jorge, I honestly am starting to wonder if we do in fact "all feel comfortable" in a cinematic experience *as* a game. But I might be generalizing my own impressions. In Heavy Rain, LA Noire, and Uncharted, I often found myself puzzling over how or why my input in the game was required or meaningful. They sometimes made me question why I was playing them at all because I felt like I was mediating them in a way that made me, as a person, almost completely transparent. In so far as gamers start to perceive what types of expression games are affording them, I think they will become less forgiving of the moments that seem like prolonged QTEs or rollercoaster-on-rails experiences, no matter how polished or smooth those experiences are. This style of cinematic aesthetic might be here to stay, but it'll be an awefully expensive niche in a few years if something doesn't change soon.